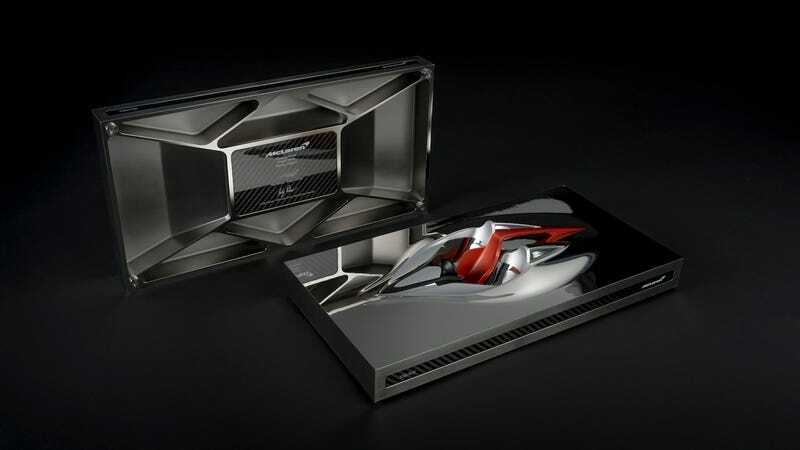 Waiting for the delivery of a $2.5-million supercar that hasn’t even been unveiled yet is the rich person’s equivalent to staring out the window and waiting for a package from an online order to come, so McLaren is helping future BP23 owners survive their wait with fancy little sculptures to remind them what their car will look like. Eventually. McLaren hasn’t even announced the official name of the car yet, and “BP23” is just what was left over from its code name during the project stages. It’s a three-seater supercar with the driver in middle like the sculpture shows, but we don’t know much about the car other than that and a claimed top speed of 243 mph. All 106 of the BP23 supercars sold out in 2016, and McLaren expected at the time to start delivering them in 2019. That’s a really long time to stand at a window waiting for the delivery truck to come. McLaren made 106 sculptures, one for each owner and none for sale because that would make them less exclusive. They’re about 16 inches long, and McLaren said each one took more than 100 hours to make—including 30 hours of polishing. Pour one out for the poor, although probably well paid, soul who had to stand by a little not-a-car and polish it for 30 hours. Still, if we were to ask the people standing by a (likely gold-encrusted) window waiting three years for the delivery truck to bring their new car, getting a small robot sci-fi car sculpture in the mail is probably better than getting nothing at all.